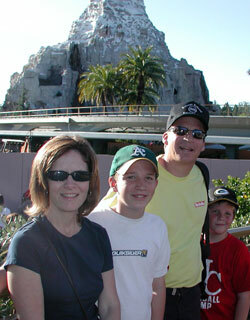 Just two weeks after going to California Adventure, we were back again, this time at Disneyland. Such an extravagant waste of time is quite unlike us, but such was the nature of the Southern Californian promotion (two for the price of one, must attend the second within 30 days of the first). Any rumors that we got 30 miles from home before Keith realized he didn't have the tickets are just that...rumors. 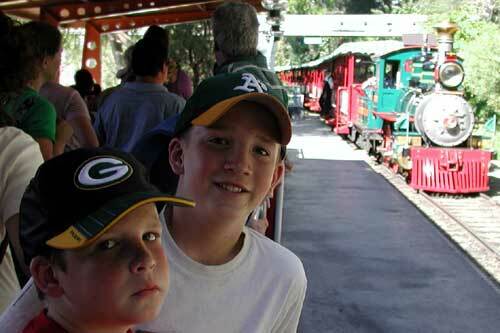 These same two kids who use to be totally afraid of roller coasters are now adrenaline junkies. Unfortunately for them, three (Space Mountain, Indiana Jones, and Thunder Mountain Railroad) of the four Disney coasters are shut down. 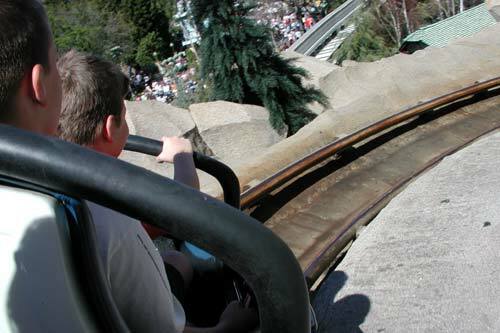 So one of the first rides we go on is the fourth and only open coaster, the Matterhorn. Here Keith breaks every well conceived rule about keeping hands inside the car to get this angle shot of the boys enjoying the ride. 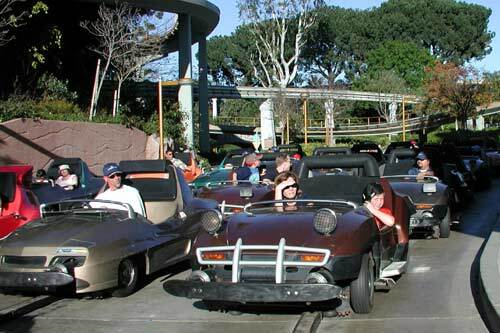 With the majority of coasters down, the Pirates of the Caribbean not living up the movie, and the Haunted Mansion not impressing today's jaded youth, we spent a lot of time on the old standby, Autopia. It's amazing the pull these cars have on the pre-teen, pre-driver ages. 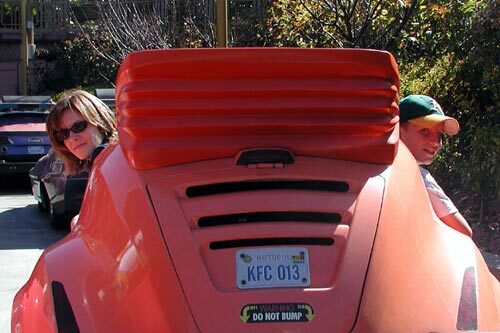 Both Brad and Doug would drive this ride all day if they could. Hey kids, quick! Turn around so I can get your picture with the approaching train. Brad is still better with snap smiles than Doug. 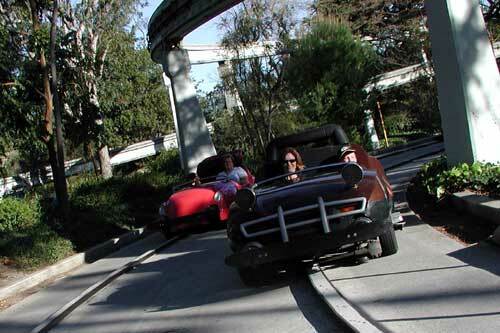 Then it's back to Autopia! 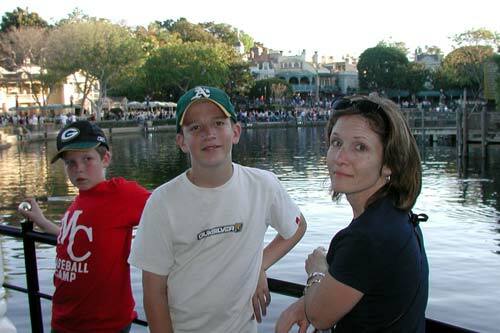 This time Brad and Doug switch parents. Brad turns to me and says, "Guess what I am, Dad." He then spins his hat backwards, turns his right hand into a cell phone, and and talks into it while distractedly steering with this left hand. 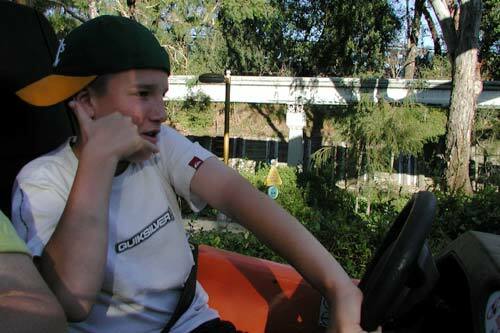 "I'm me, as a teenage driver!" He was kidding, I'm pretty sure. It is a hot day. And spirits are starting to lag by late afternoon. Keith's backpack is representing him in this picture. As you can see by the background, it's pretty crowded for a Sunday in March. There's nothing we want to ride on any more that doesn't have an hour long line. So after a cooling, calming ride around Tom Sawyer's island on the river boat, it's time time to call it a day and head home.